As I ran around my house the other day screaming, “I need natural light!” I was reminded of the adorable card I received awhile back with an 8-year-old’s words of wisdom captured creatively by © Kate Harper Designs. Could such a simple suggestion for getting yourself out of the winter doldrums be expressed more eloquently? BTW, you’ll love Kate’s whole collection — check it out at http://kateharperdesigns.com/. Just like the lack of natural light in the winter can affect our moods, so can color. And of course, color and light (or the lack of it) work together. The other morning as I turned the lights on again in my living room for yet another dreary gray wintry day, I glanced at the wall behind the sofa one last time. That’s it! No more dark and dramatic — I cannot stand it any longer. I dashed to the garage for the can of primer and rolled away my winter blahs. What a transformation! All of a sudden the room felt lighter and brighter and amazingly enough, so did I! The same thing happened when I moved my office into my son’s old north-facing bedroom. The wall color he had chosen was rich and cozy and cave-like — we even painted his ceiling to create the mood he requested. It worked for him since sleeping in there did not seem to be a problem. But for me? Forget it. I tried adding lamps and task lighting, but the dark walls drove me nuts. Again, I dragged the paint primer from the garage, threw down a drop cloth and primed over the entire room from ceiling on down. Unbelievable — we went from cave-like to cathartic in one afternoon! The lack of color in a room can be just as depressing as colors that are too dark without adequate light. Anyone who has builder-white walls will note that the white turns to gray in the shadows. And although gray is the new beige for neutral wall color, if it’s not for you, then paint it out! Warm yellows like Ben Moore’s Sweet Butter (171) will certainly brighten your day. And fresh springy greens like Folk Art (528) will liven up a gray-green that’s bringing you down. Add a little Sea View (836) to a piece of furniture in your room and you’ll think you’re on vacation! I painted the walls in my new office a whisper of yellow called Marble White (Ben Moore 942) and voila! Let there be light! 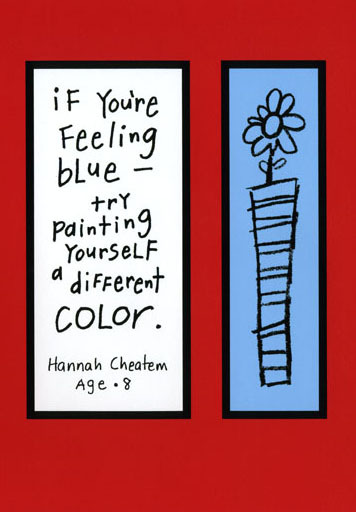 So if the winter blahs have you feeling blue, take the greeting card’s sage advice and paint yourself (or your room) a different color. Since our homes are extensions of ourselves, then it makes perfect sense that brightening our spirits may be as easy as picking a different wall color. It worked for me! This is sooo true. We didn’t do anything as drastic as painting our whole living room, because we just painted a little over a year a go and like the cozy feeling. But we did paint the window frames in the living room white, and it brightened up the whole room. You are currently reading Banish the Blues with Uplifting Hues at Your Home & Color Coach.